Hail and greetings! PLease allow me to introduce myself. I am talon Leatherwing,the Dark knight, and I bid you welcome to my humble, (all be it a little damp)abode! Please come in and relax! As you may be able to see,i have some interest in things medieval. If you do as well,then you have come to the right place! So please,pull up a chair whilst I fetch a flaggon mead. We shall make merry and discuss that which interests us (as well as many others,i have discovered to my great pleasure)both. 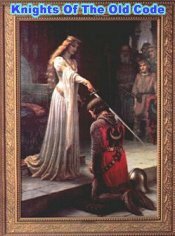 i have always believed in the ideals of knighthood,and been facinated with weapons and armour of that long,bygone age. Please feel free to explore my cave,you will find many things that may spark your interest! There are instructions on making the War Cloth of Odin:chainmaille,as well as a Glossery of Terms that can help along the way. There is a page of interesting sites I have found during my exploration of this wonderful ether,the Internet,as well as a Gallery of Pictures of my armouring projects in various stages of development. ( I may even sneak a few recipes for Mead,the Drink of the Gods,somewhere along the line. Just don't let my librarian know,he's a bit of a prude!) I even plan on posting pics in an Armoury of my collection of weaponry,large and assortted it is! I,also,invite you to sign my guest book,and even take a peek to help get in contact with others like yourself, those interested in those wonderful periods of history in which you are facinated with. If there is anything you wish to see here,or any ideas in helping inprove my Cave,please feel free to shoot me a parchment at: talonleatherwing@hotmail.com, or leave a comment in my guest parchment! Let me know what you think! 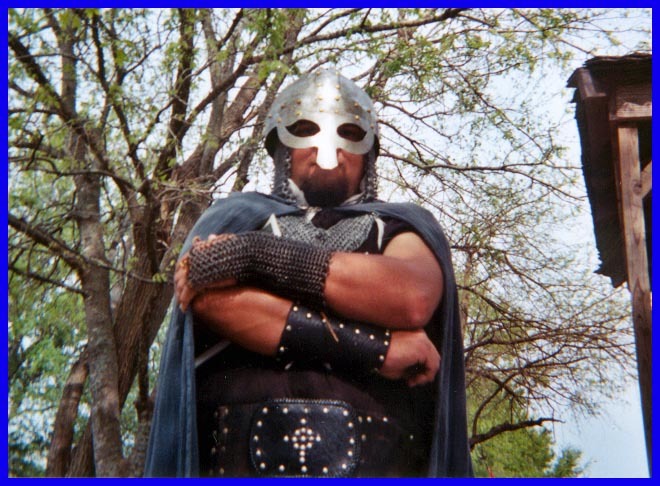 updated- brand new Gallery page-Scarborough faire 2002! You are kind soul number that has braved the wild and graced my abode with your presence,and I thank you for your kindness!